The Faerie Thorn, adapted from Jane Talbot’s short story collection of the same name, haphazardly yet compellingly leads its audience into a idiosyncratic fantasy-meets-reality world. Northern Ireland’s irreverently inclined Big Telly Theatre Company, now in its 30th year, has created a world full of trolls, fairies and mermaids seamlessly wedded to themes of marriage, family and community. From something as simple as a farmer’s dissatisfaction with monogamy grows something much more complicated and enthralling. Starting with the story of farmer Man Donaghy, his two wives and the creepy little folk who live beneath the titular tree, The Faerie Thorn winningly builds on this idea with a blend of familiar and fresh narrative tools, running jokes, weird masks, weirder puppets and, most memorably, a dance sequence in which both the music and movement are slowed down. The second act of Zoe Seaton’s production is more energetic than the first, with the intriguing fantasy backgrounded for more comic antics. Every moment is crafted to startle, amuse or excite, at times all three, and, while not everything works, the company’s audacity is consistent and admirable. All five performers multi-role with style. 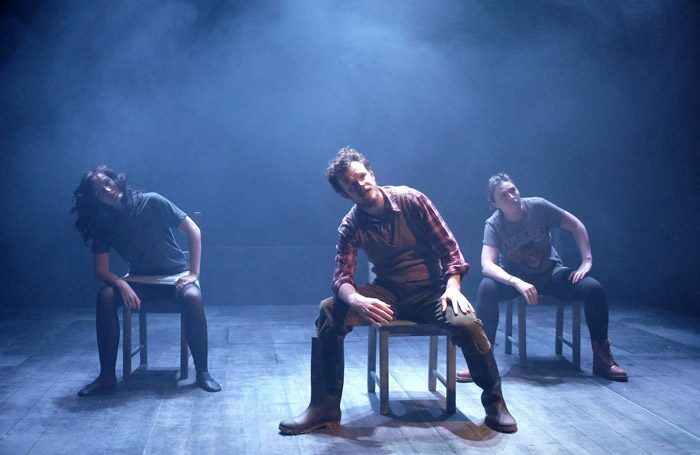 Shelley Atkinson and Nicky Harley merge staggering, sometimes unsettling impressionism with degrees of silent poignancy, Rory Corcoran expresses relentlessly comic aptitude and Seamus O’Hara’s deadpan seriousness is evocative. Most revelatory is Big Telly newcomer Colette Lennon, a lithe, nimble presence with a booming singing voice given the spotlight on three very different, original musical numbers.